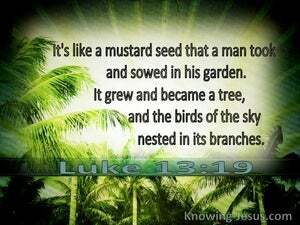 ﻿ Luke 13:19 "It is like a mustard seed, which a man took and threw into his own garden; and it grew and became a tree, and THE BIRDS OF THE AIR NESTED IN ITS BRANCHES." It is like a mustard seed that someone took and planted in his garden. It grew and became a tree, and the birds of the sky nested in its branches." It is like a grain of a mustard plant, which having taken, a man cast into his own garden. And it grew and developed into a great tree, and the birds of the sky lodged in the branches if it. It is like unto a grain of mustard seed, which a man took, and cast into his own garden; and it grew, and became a tree; and the birds of the heaven lodged in the branches thereof. It is like a grain of mustard seed, which a man took and planted in his own garden; and it grew and became a tree, and the wild birds found shelter and roosted and nested in its branches. It is similar to a seed from the mustard tree, which a man took and planted in his garden. And it grew and became a [large] tree, and the birds of the sky roosted in its branches." It is like a grain of mustard, which a man took, and sowed in his garden; and it grew, and became a great tree; and the birds of the air roosted in its branches. It is like a grain of mustard seed which a man took and put in his garden, and it became a tree, and the birds of heaven made their resting-places in its branches. It is like a mustard seed, which a man took and sowed in his garden; and it grew and became a tree, and the birds of the air nested in its branches." it is like a grain of mustard-seed, which a man took, and sowed in his garden: it grew, and became so large, that the birds of the air built their nests in its boughs. It is like a grain of mustard seed which a man took and cast into his garden; and it grew and became a great tree, and the birds of heaven lodged in its branches. It is like a grain of mustard seed, which a man having taken, cast into his garden; and it grew, and became a tree; and the birds of heaven lodged in its branches. It is like a mustard seed that a man took and dropped in his garden, and it grew and became a tree, and the wild birds roosted on its branches." It is like a grain of mustard-seed which a man took and cast into his garden; and it grew and became a great tree, and the birds of the air lodged in the branches of it. It is like a grain of mustard seed, which a man took and cast into his garden; and it grew and waxed a great tree; and the fowls of the heaven lodged in the branches of it. It is like a kernel of mustard, which a man having taken, cast into his garden; and it grew, and became into a great tree; and the fowls of heaven encamped in its young shoots. It is like a grain of mustard seed, which a man took, and cast into his garden; and it grew, and became a great tree; and the fowls of the air lodged in the branches of it. It is like a mustard seed that a man took [and] sowed in his own garden, and it grew and became a tree, and the birds of the sky nested in its branches." It is like a grain of mustard seed which a man took and threw into his garden. And it grew and became a great tree, and the birds of the air lodged in its branches. It is like a grain of mustard seed, which a man took and sowed in his garden: and it grew, and waxed a great tree, and the fowls of the air made nests in the branches of it." It is like a grain of mustard-seed which a man took and put into his orchard, where it grew up and became a tree, and the wild birds roosted in its branches." "It is like a grain of mustard seed, which a man took and cast into his own garden. It grew and became a tree, and the wild birds nested in its branches." It is like a mustard seed that a man took and sowed in his garden. It grew and became a tree, and the wild birds nested in its branches." It is like a grain of mustard seed, which a man took, and put in his own garden. It grew, and became a tree, and the birds of the sky lodged in its branches." It is like a grain of mustard, which a man took, and cast into his garden; and it grew, and became a tree, and the birds of the air lodged in its branches. It is like a mustard seed which a man took and cast into his garden; and it grew and became a great tree, and the birds of heaven lodged in its branches. It is, like, unto a grain of mustard seed, which a man took and cast into his own garden; and it grew, and became a tree, and, the birds of heaven, lodged amongst its branches. It is like a grain of mustard, which a man took and put into his garden; and it grew, and became a great tree; and the fowls of the air lodged on its branches. It is like a mustard-seed which a man took and put in his garden. The seed grew and became a tree, and 'the wild birds roosted in its branches.'" It is like a grain of mustard-seed, which a man took, and cast into his garden, and it grew, and became a great tree; and the fowls of the air lodged in the branches of it. It is like a mustard seed which a man drops into the soil in his garden, and it grows and becomes a tree in whose branches the birds roost." It is like a mustard seed which a man took and dropped in his garden, and it grew and became a tree, and the wild birds roosted in its branches." It is like a grain of mustard seed, which a man, taking, cast into his own garden; and it grew, and became a tree; and the birds of the heaven lodged in its branches." It is like a grain of mustard-seed, which a man took and sowed in his garden, and it grew, and became a great tree, and the birds of the air lodged in it's boughs. 18 So He was saying, "What is the kingdom of God like, and to what shall I compare it? 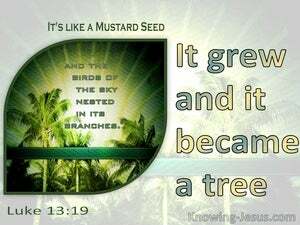 19 "It is like a mustard seed, which a man took and threw into his own garden; and it grew and became a tree, and THE BIRDS OF THE AIR NESTED IN ITS BRANCHES." 20 And again He said, "To what shall I compare the kingdom of God? And He said to them, "Because of the littleness of your faith; for truly I say to you, if you have faith the size of a mustard seed, you will say to this mountain, 'Move from here to there,' and it will move; and nothing will be impossible to you. For as the earth brings forth its sprouts, And as a garden causes the things sown in it to spring up, So the Lord GOD will cause righteousness and praise To spring up before all the nations. 'All the birds of the heavens nested in its boughs, And under its branches all the beasts of the field gave birth, And all great nations lived under its shade. "You continued looking until a stone was cut out without hands, and it struck the statue on its feet of iron and clay and crushed them. 'Its foliage was beautiful and its fruit abundant, And in it was food for all The beasts of the field found shade under it, And the birds of the sky dwelt in its branches, And all living creatures fed themselves from it. For it will be a unique day which is known to the LORD, neither day nor night, but it will come about that at evening time there will be light. And the Lord said, "If you had faith like a mustard seed, you would say to this mulberry tree, 'Be uprooted and be planted in the sea'; and it would obey you.